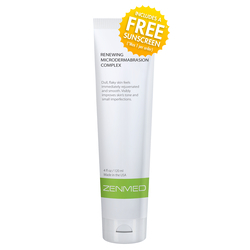 If you have acne or problem skin, then ZENMED has a solution for you. They have a whole range of skincare dedicated to acneic skin. They also have skincare for anti-aging and normal skin. ZENMED has an entire line of skincare dedicated to the needs of everyone's skin. I tried a few items from the line and my reviews are below. 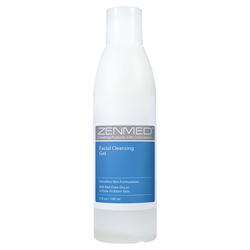 ZENMED's Facial Cleansing Gel is a gentle pH balanced gel cleanser designed to be gentle to troubled skin. I will not irritate problem skin. Use it twice a day, morning and evening to help with acne. This formulation will not cause dryness or irritation common with major brand name cleansers. It is a naturally-based formulation (with Certified Organic Aloe Vera Gel and Tea Tree) that removes oil, makeup and unwanted residue from the surface of the skin, all while maintaining the skin's natural protective barrier. Cleansing is the first step in helping to prepare the skin for using their Acne treatment products like the Derma Cleanse® Acne Gel or Botanical Acne Mask and Spot Treatment. It is oil-free and alcohol-free. Doctor-formulated to be gentle to sensitive skin or skin undergoing aesthetic treatments like peels and Acne medications. This cleanser is for all skin types, but is ideal for troubled skin suffering from Acne or Rosacea. It removes makeup and oils without upsetting the skin. I like this cleanser. It is made with natural botanical extracts. This cleanser does not clog your pores or make things worse with acne. It does the job and gets rid of makeup, dirt and oil. And it does it nicely. It even does a good job with eye makeup. The scent can only be described as herbal. This cleanser is better for those with oilier skins, sensitive skins and acneic skins. ZENMED's Renewing Microdermabrasion Complex is a granular formulation based in a mineral-heavy clay that is designed specifically to provide intensive dermabrasion on the surface of the skin. It does not leave any residue or greasiness behind. This product is ideally used before treatments such as the Skin Eraser as it allows for better penetration of actives. Soap-free cleansing using the benefits of smooth Montmorillonite clay. If you have dull, flaky skin and use this it will immediately feel rejuvenated and smooth. This product is ideal for use before applying any sort of treatment, serum or moisturizer. Makeup junkies swear by this product as it smooths the skin without using soaps so skin does not feel dehydrated or uncomfortable afterward. Concealers and foundations go on flawlessly after using this effective manual exfoliator. Skin glows fresh and feels more plump. It is fast becoming ZENMED's TOP SELLING PRODUCT! This product is ideal for people with sensitivities to various cleansing agents and emulsifiers. It should be used in the evening and the use of sunscreen during the day is highly recommended. Sun exposure should be minimized. This is for all skin types. It is ideal for dull tone, helping Skin Eraser and moisturizer penetrate better into the skin. Helps smooth, rough, uneven skin. Step 1: At night cleanse skin and leave damp. Step 2: Apply small amounts of product to the face and neck. Step 4: Rinse face completely and pat dry. This is one of the best "microdermabrasion creams" I have had the pleasure to use. It has clay, ground walnut shells and many botanical extracts in it. It is not as rough as some of the microdermabrasion creams on the market, but provides just enough exfoliation that my skin feels amazing afterwards yet does not feel as if I peeled all the upper layers off in one fell swoop. I would recommend this to all skins except those with active acne and the most sensitive of skins. 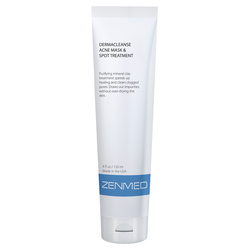 ZENMED's Dermacleanse Acne Mask & Spot Treatment is a Montmorillonite-clay based Acne treatment that helps to heal acne pimples fast and prevent excessive oil buildup on the skin. When applied as a mask to the affected areads it clarifies the pores and helps to draw out impurities. Used as a spot treatment overnight, it reduces the severity and healing time of Acne. One of the major complaints often heard from those who suffer from Acne is excessive oiliness. When applied to the affected areas, you can expect this mask to give you a quicker healing time and reduce the severity of an Acne breakout. The mask component of this treatment helps to remove unwanted greasiness that may be aggravating an already troubled complexion. After you cleanse off the product, skin does not feel dehydrated or uncomfortable like it does with other masks, but skin instead feels soft and free of oil. When applied as a spot treatment to Acne pimples, whiteheads and clogged pores (blackheads), a dramatic difference is seen in healing time and also in redness and inflammation. Step 1: Apply a thin layer of mask product to affected areas only (avoid eyes, nostrils, and lips). Step 2: Wait about 2-5 minutes until mask dries and then rinse off completely or leave on overnight. This mask has a lot of healing ingredients in it, such as chamomile, witch hazel, sage, kaolin and zinc oxide. These ingredients are known for their ability to help with healing, redness and inflammation. I think this mask is a miracle worker. When I had a small breakout (due to seasonal changes, which is the only time I break out), I used this mask and it immediately helped with the small pimples I had. I used it as a spot treatment and the pimples had almost disappeared by the next day. The redness was gone and the swelling had dwindled to almost nothing. Great product. I would recommend this for all skin types. 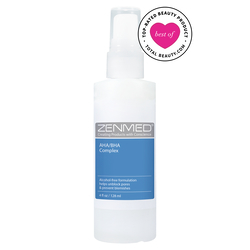 ZENMED's AHA/BHA Complex is an alcohol-free alpha/beta hydroxy acid toner created to be used like a traditional toner would be use. It helps unblock and minimize pores, clear up post-acne discoloration, balance patchy combination skin and gradually remove dead skin cells from the surface of the skin. A predictable complexion starts with healthy cell turnover and preventing cell build-up. After cleansing with a mild cleanser, such as ZENMED's Facial Cleansing Gel, use this product to clear out dead skin cells. Helping the cell turnover process, using this product smooths unwanted bumpiness and flakiness. Since this product does not strip oil like traditional toners, there is no "rebound effect" that is commonly seen with major brand named products. Try for 7 days then stop for 7. See what a difference it makes. This is fast becoming one of ZenMed's best selling products! It is ideal for all skin types, even sensitive. Helps remove flaky skin, it brightens the complexion, prevents clogged pores and prevents blackheads. This toner is certainly one of the better toners I have ever used. I love AHAs/BHAs. I would use them all the time if I could. Having them in a toner is perfect because I can use them after cleansing to get rid of the dead skin cells that may not have been left behind from cleansing or from the microdermabrasion cream. I also like to use this after the microdermabrasion cream. It helps set the stage for my skin to take in actives. 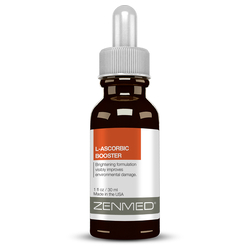 ZENMED's L-Ascorbic Booster Serum is a wonderful Vitamin C Serum that helps to boost collagen levels, it softens wrinkles, plumps the skin and improves hyperpigmentation. It will help to create a more even skin tone and a smoother texture on the skin. Boosting collagen levels builds support under the skin, making it appear more radiant, firmer and younger. Vitamin C has long been known as one of the top anti-oxidants for neutralizing free radicals. This serum will help improve visible environmental damage while boosting new collagen creation. The powerful Vitamin C formulation works specifically on pigment changes, loss of tone and volume. Apply a thin layer over entire face and neck (avoiding eyes and lips). Make sure to use a sunscreen when using this product. Do not use on irritated or broken skin. I am a huge proponent of using a Vitamin C Serum in your skincare routine. This is definitely a very good one. L-Ascorbic Acid is a good form of Vitamin C. The goal is to produce new collagen, help with pigmentation issues, loss of tone and dullness. This serum does all of that. It is a great serum and you really don't need that much for the whole face and neck. I love products that really work and work well. ZENMED is available online at www.zenmed.com. Like ZENMED on Facebook:https://www.facebook.com/zenmed/; Follow ZENMED on Twitter:@zenmed/; Follow ZENMED on Instagram:https://www.instagram.com/zenmed/ and Subscribe to ZENMED on YOUTUBE:https://www.youtube.com/user/zenmed/.